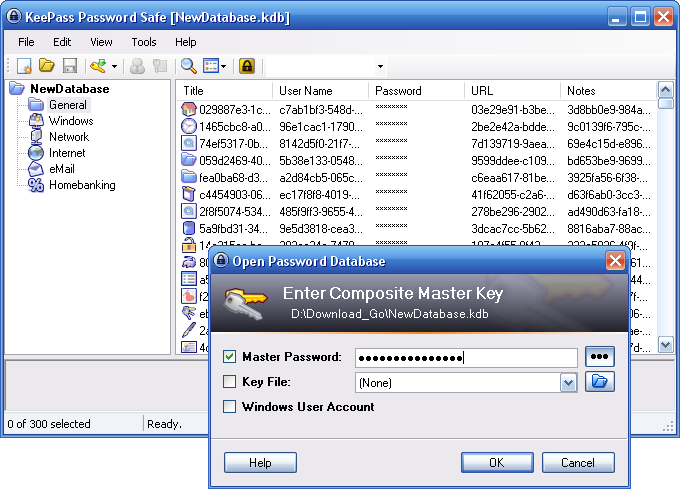 KeePass is a password manager that deals with open source password and data management activities for users with moderate usage. It is reliable and simple to use manager that deals with day to day activities of their clients for managing their email account passwords, bank records, and website's account password details. It can deal with many more features and activities for active users at a moderate fee for a much enthusiastic experience. However top competitors like RoboForm and SplashID Safe have much better work interface to work with, but KeePass keeps it's design and authoritive work as simple as possible. It helps you deal with different passwords for all your different websites activities and makes sure that no spam hits your account in meantime. Unlike other password managers, KeePass keeps your working schedule noted everytime so that you can monitor your software use without any complex security notifications. You don't need to set any alerts for your spams! KeePass ensures that your account in their software remains safe all the time with high encrypted passwords to make sure you work safe 24 hours a day. We have made a typical list of features that enable the best usage and understanding of KeePass Safe manager. So scroll down the resource to see some more information about the software. KeePass Safe is enabled with rich features for newbies who haven't discovered what password managers are capable of. KeePass ensures that whatever data you exchange between your website and the software shall remain intact secure to make you feel comfortable when you use it for further exchange of datas. It records and monitor data activities through filter settings to protect your identity and password breakout. Now you can manage your password tracking quite easily through assword management activity. Through this feature, you can subdivide each website local into groups and subgroups. It is also possible to categorize a particular group of website under one category and subs categorize them according to the number of users given permission to different websites. Sub-grouping helps you keep away from mixing of passwords and conclude less confusion when you are dealing with large number of websites. KeePass is enabled with special configuration system that lets you fill up forms and usernames even when you run the application background. So when you open any of your website to fill your login details or any other form, KeePass will fill it for you by just pressing a key on your keyboard. This Hot-key acts as an instructor for KeePass to start filling web forms whenever the web page opens up automatically provided you have give the website input into the feed of the software application. Also you can sequentialize your websites according to the form filling requirement on KeePass without having to open them separately, as the software application automatically opens and fills the forms directly to move to another website. 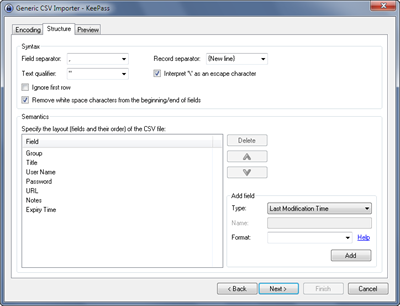 KeePass gives you the authority to import files ranging from different formats like CSV file format, TXT file format for Code Wallet, XML file data and so on. You can extract the files from the given source codes to use them to further use. This is done in order to protect your files from outward exposure to malware activities. Using Password keeper, you can extract, export and import all types of file format to different users. Generally files are secured these days through a master password use which ensures that all your accounts are directly logged in when you input your master password correctly. This isn't safe sometimes! A hacker can hack all your data accounts including your confidential info if he's able to break your master password. In such cases, KeePass has ensured a Key file usage for every account and website that ensures that even if master password is correctly inputted, it will require the Key file to open securely. Carry your Key Files into your own storage device to unlock applications with your master password everytime. 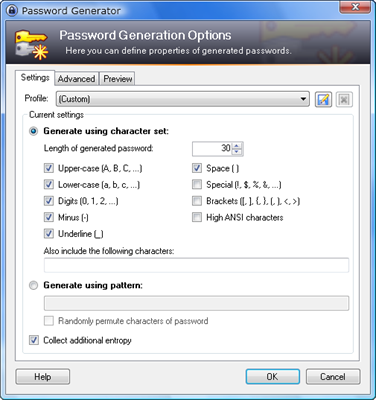 Now KeePass helps you generating strong passwords relevant for your usage on different files and activities. The password generator requires your input and then generates a list of random passwords which is equally strong that no-one could break out. So generate long password with the ultimate password generator to safeguard your data. Now with the latest KeePass plugin feature, you can archive files in a comfortable manner. A supported number of file format increases giving you better accessibility to use your password manager in a better way. You can create plugins on your KeePass Password Safe manager to ensure better handling and management of your password protection activities. With KeePass, you cannot deny the statement that your data is fully secured. Provided with password encryption of AES and Two fish algorithm, your data remains secured in every possible way everytime. Not only you are ensured with your password management safe, but your web form filling details also remains secured with such a modulation. You can prevent keyloggers to work by working on private browsing data where your master password is securely attached to the top window. It helps you prevent from hackers trying the dictionary and guessing attacks on your password keybox. Before downloading KeePass on your system, you may have wondered whether you need to download anything extra or keep in mind the factors like software registry tools and all. The portability feature on KeePass ensures that you can carry your password manager anywhere without any trouble of getting hacked! Download the .zip file for USB download settings and use it when you are moving on with your data. You must be wondering if you could shift your database work from installer to portable, then definitely you can do so. Keep the settings to transfer mode and transfer all your files and passwords to your USB device without having to lose them. Now with the option of updating your information instantly, you can either search or sort your information with specific keyword inputs into the search box. Your sub category files will list all your details once you are done with the process of file sorting. Key in your required info at the column header, and you will see a list of password data entries retrieved for you instantly! Since KeePass is open sourced password manager, you can work on making it feature rich or include features relevant to your usage. Well if you are keen to develop your own password manager, take KeePass as the base for it. If you are not happy with KeePass's security algorithm measure, then integrate the source code to change the way it works according to you. You need to be highly trained on IT soft skills to know how this works. Certain versions of KeePass are not equipped with data sync feature. You can work on this measure to make it available on your own modified version. So use your OSI code development initiative to prepare your KeePass modified source code programmable on PCs and smartphones. What are the available Software versions of KeePass for your PC? It comes with the installer version and the portable version equipped for personal use and hands on experience for first time password manager users. It contains .exe file for Windows based users, where you can download the same and extract the file from the database. After extracting it, run the same for installation process and follow the guidelines. If you are sole user and administrator of your PC, then you can readily download the file unless you need administrative rights for the download process to occur. Obtain the same if you are not the admin of your PC, so that you can unlock the application for further use. There is also a portable version available on the 1.26 version downloadable on your USB device. Use this version when you feel carrying your data and password manager on your finger tips when you travel for business trips. When you download the portable version of KeePass, you don't need any further installation of plugins and all for specific browser logins, as it keeps changing from PC to Desktop computer. Store your entire activity safe with the classic version and safeguard them in a better manner equipped with high storage when you are using the device on different servers to prevent spamming. You can use this version on all platforms of Windows from Windows 2000 to Windows 8. GDI+ should be enabled as a prerequisite before using this software which is already present on all the versions of Windows. If you are looking for a KeePass edition that enables you to use all the features with latest updates and directories, take the professional version into your account. Even this comes with a portable and installer version of the software designed for heavy usage. Currently all the features including the new additions from KeePass software centre are included in the installer version of professional edition. Download the same and follow the guidelines as mentioned above for classic version to access your software for immediate use. For the portable edition, sync won't be included as of now, so you will have to compromise sharing your information with your colleagues. Follow the similar procedure a for portable version to get access to the application. It supports the entire version of Windows, Mac and Linux with Microsoft .NET framework with version 2.0 and higher as an added requisite before using professional edition. You can use 2.x versions for Ubuntu Linux and Mac OS X as a recent unofficial update from the company. All other new updates are also available for your smartphones which includes Blackberry, Android, Windows and iOS devices. KeePass is secured through a process that is difficult to jail break information for any of its user. So if you believe KeePass is the one that you want to have for future password management and data activity process, we will be glad to give our response on the product which stands to hold some advantage and disadvantage to deal with. Pros of using the product: KeePass supports ideally two versions of any of its downloaded copy. They are portable and installer. With the installer, you can get all the details while your PC carries it, and the portable version allows your data management activity on your USB device. You can store your passwords and related information on your USB device for better accessibility everywhere. KeePass is absolutely free to use which means it is an open source product. As an open source, it can allow their users to check the working and strike a correct balance for their OS with soft coding on their HTML code source. So it's great to work with KeePass even without paying anything while you get full access to pro versions. You can work with your KeePass on any browser interface without having to install any kind of plugins for the same. Develop your auto login feature extensively by working on your open source code for KeePass. If you are a professional designer, you can key in the code which will work as an auto login feature on the software. Cons to work on: There is no online sync system that KeePass takes into account. With this feature, your password generator works as an input known to you locally. On the other managers, sync system is enabled which gives password manager applications the idea to sync them directly when you are working online on a website. Some people have reported errors on the use of clipboard manager as the keylogger can easily copy the password even when using on private browsing schedule. So this is an area where KeePass needs to do some update to get things back on track. There is no on-screen keyboard that subsidizes its biggest disadvantage among all. This is a must for all password managers as it schedules and makes your password activity safe from being keylogged. Therefore even though it's free, the password manager needs to develop a strong interface that could work as a medium to disable keylogging effectively. Is it worth buying KeePass as a password manager for future office work and personal use? Well we can't deny the fact that KeePass is holding a strong password interrogative interface that works as a manager to handle both your data and password activities. Since it is an open source manager, we cannot complain much about its features and certain issues that has been reported till date. Password Managers are the one that accomplishes all their management activities whether it's the scheduling of updates, processing for virus attacks or more. KeePass is a simple password manager that keeps tracks of your important personal info and carries full proof security settings to enable your usage at a safer rate. KeePass keeps your identity and information always up to the mark with latest activities and keeps track of your login data to make your transactions secure. We believe that KeePass definitely holds the edge in near future provided it gives enough evidence and online support for their users in future.